(By INSIDER AMPLIFY | January 16, 2019 2:00 pm ) – When now 11-year-old Olivia Brandon experienced bullying at school, it affected her self-esteem, which, consequently, affected her behavior in school. 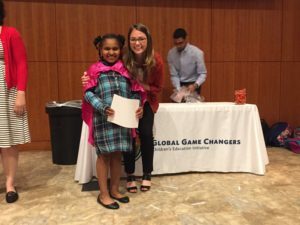 Olivia, and her younger sister Monica, began participating in the Global Game Changers (GGC) program while they attended Whitney Young Elementary. GGC provided Olivia with another adult with whom to discuss the bullying. GGC helped her approach the problem differently and showed her other ways to react. But that was only part of the benefit of the GGC program. Olivia Brandon at GGC graduationMY TALENT + MY HEART = MY SUPERPOWER™. That’s the simple equation making a positive impact on thousands of young children in our area thanks to GGC. The program seeks to help children realize how that equation fits into their lives and how they can use it to benefit others in the community. In Olivia’s case, the talent was baking and her heart belonged to the seniors at the property her mother manages. “A lot of times we put on the child what we think they’re good at,” Olivia’s mother Antoya said. But GGC gives children the opportunity to decide for themselves.” After Olivia aged out of the GGC program, she was asked to come back to volunteer with the program and give encouraging words to middle schoolers currently in it. The educational nonprofit, started in 2013, has developed a social and emotional learning curriculum designed to empower and inspire young children. 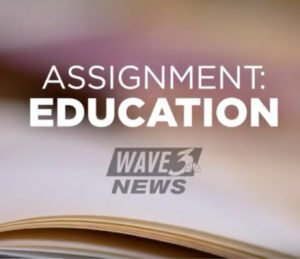 This curriculum is helping educators across Louisville to bring children a sense of identity and purpose at an early age. Though you may have not heard of GGC, in just five years this nonprofit has amplified its impact through collaboration with funders and community partners. According to Helson, the GGC staff is a small but mighty team. Chief Program and Curriculum Officer Anne Walker has been responsible for the high quality of the curriculum ever since GGC was founded by Helson and her daughter, Rachel Annette. Walker’s husband, Justin, a Brandeis law professor, also serves as a volunteer executive director. Helson said the group has been a core part of the strength of the organization and its rapid growth. When Helson first started GGC, she enlisted education evaluation experts from JCPS and the University of Louisville. “We have to tell stories about our work but also have measurements and data to support it. That makes us fairly unique in terms of nonprofits,” she said. That is one way that Helson impressed early adopter funders like the Gheens Foundation. “Everyone is passionate about their nonprofit, but Jan was so professional with research and data,” said Kathy Knotts, Grants Administrator. “She engaged a U of L professor and JCPS Evaluation Specialist to do pre and post testing and looking at scores. She is always seeking outside sources and validation. 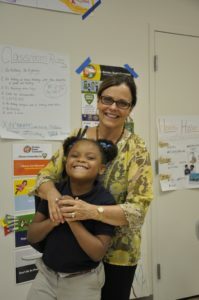 She is trying to improve the lives of children she is serving, and she doesn’t take that task lightly,” said Knotts. 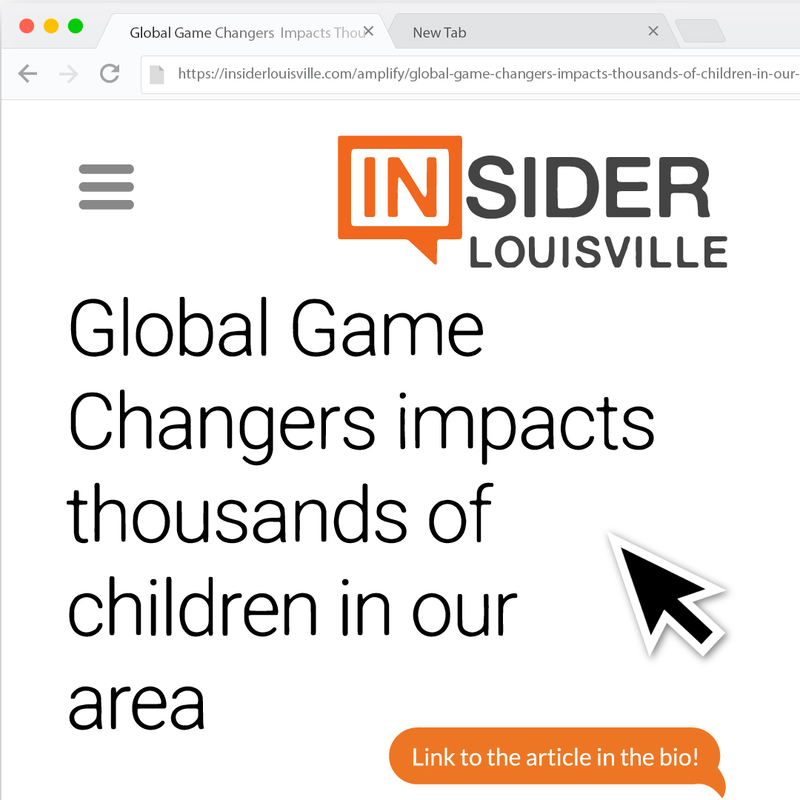 The Global Game Changers curriculum is taught in many JCPS and other area classrooms, as well as at YMCA Childcare Enrichment Program sites and Boys and Girls Clubs. But Helson’s “pride and joy” is the signature GGC In-Residence Program. This city-wide collaboration began as an expansion from the success of GGC’s other programs. Despite the scope, Helson felt they still were not “reaching a core demographic of students who don’t get to go to afterschool programs. 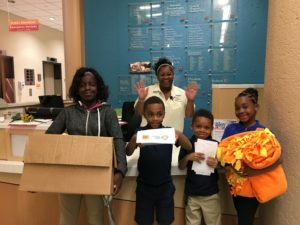 These kids are going home in the afternoon by themselves and are truly our most at-risk and underserved population,” she said. To help bridge that gap, GGC created a direct-service “in-residence” program outside school to expand the world of those at-risk students. They identified schools in need of after-school programming, worked with their principals and partnered with cultural sites in the community to host. “Our goal is to remove the barriers that typically prevent at-risk students from participating,” said Helson. The program is grant-funded and free to all students and transportation is provided. Global Game Changers recently received a $100,000 challenge grant from Kosair Charities with a dollar for dollar match to support the In-Residence program. “It is important to make clear that one of our goals is to remove the barriers that typically prevent at-risk children from participating in high-quality after-school programs. To do this the program is grant funded and free to all students and transportation is provided,” said Helson. 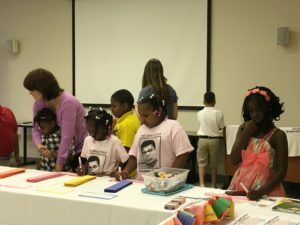 The program began in Spring 2016 at the Muhammad Ali Center, and other participating sites include Louisville Free Public Library, Frazier Museum and Speed Art Museum. Erin Herbert, director of programming at the Muhammad Ali Center, said, “GGC’s framing of ‘my talent + my heart = my superpower’ felt aligned with our belief in greatness through service to others. Every single person has the opportunity to be great, achieve, give back and be a part of our community,” she said. Herbert said one thing she finds “incredibly innovative” about the GGC partnership is the wraparound services for the children, which give them more opportunities to participate. “They work with the same group of students for academic, family resource counseling, and transportation. They even go home with a hot meal in their stomach from Dare to Care, and also knowing people care about them. We can set students on a new trajectory for success,” said Herbert. Byck Elementary principal Carla Kolodey said she appreciates that GGC wants to target students with challenging behaviors that other programs exclude. “Those are the students that need the social and emotional learning so much. That’s so positive for us. We need to help those students.” Byck was a pioneer in incorporating GGC curriculum and hired a teacher to teach it throughout the day so every student at the school gets a weekly dose of MY TALENT + MY HEART = MY SUPERPOWER™. Kolodey said a great example of the curriculum in action is one fifth-grader who had been touched by the violence in the community and wanted to make a difference. “He decided his talent was to be a radio show host, so he took ownership to research and figure out what his platform would be. He took his passion and used his talent to talk to people about violence in the community. That was very authentic for him,” she said. Another important collaboration for GGC is with University of Louisville undergrad education students who serve as hands-on mentors for the young children as part of their course requirements. Helson said, moving forward, Global Game Changers wants to be the premier social and emotional learning curriculum in the nation, and Lift a Life Foundation is committed to helping to make this happen. GGC received a million-dollar grant from Lift a Life over three years with two goals: to build a free online educator platform portal available for anyone to access GGC curriculum (scheduled to launch in January 2019); and to produce a pilot for a Sesame Street-style children’s TV show based on superhero characters inspired by one of two children’s books written by Helson and her daughter. 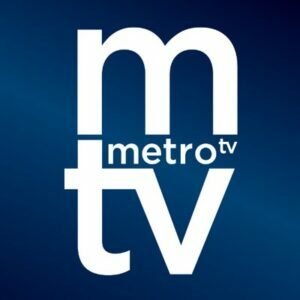 Helson has already met with PBS and a KET affiliate and even approached Netflix.